Think you've got the potential to be crowned Drummer Of The Year? Well, as it happens, Rhythm are on the hunt for the UK's best undiscovered drummers. 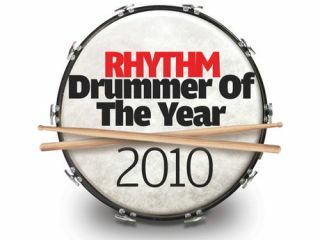 The magazine is calling for talented drummers to enter the 2010 Drummer Of The Year competition. Anyone 18 or over can enter simply by submitting a short video of themselves performing a solo drum composition via the Rhythm website. Finalists will be invited to perform live in front a panel of expert drummers and industry insiders at the London Music Show on Sunday 10th October. The panel are looking for the drummer who can display the best technical ability, taste and feel as well as executing the best performance and delivery. Rhythm promise the winner of the competition 'awesome prizes' to go along with the ultimate kudos of being crowned Drummer Of The Year. Entries must be submitted by no later than 5:00pm GMT on Monday 26th July. For more details along with full terms and conditions head over to the Rhythm site, or to go ahead and enter click here.